It's been a good month for Lycomormium here. 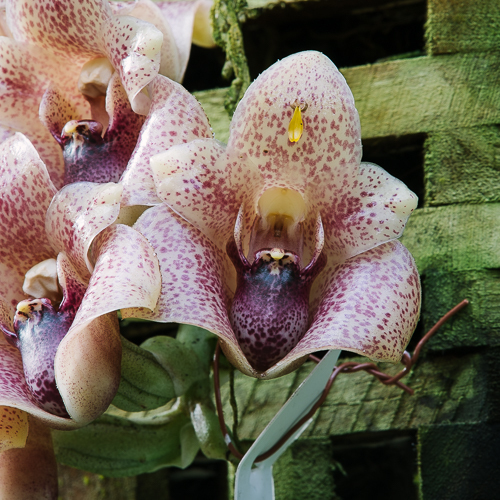 This species has been flowering for three weeks, jostling for attention among the fiskei baskets in the Orchid Display House. Since we haven't yet produced seedlings from any of our Lycomormium species, this month presented a terrific opportunity to get some capsules on our plants. Unfortunately, Lycomormium is incredibly difficult to pollinate using pollinia fresh from the anther cap. The yellow pollinia are like twin balloons that resist being stuffed into the narrow opening of the stigmatic cavity. 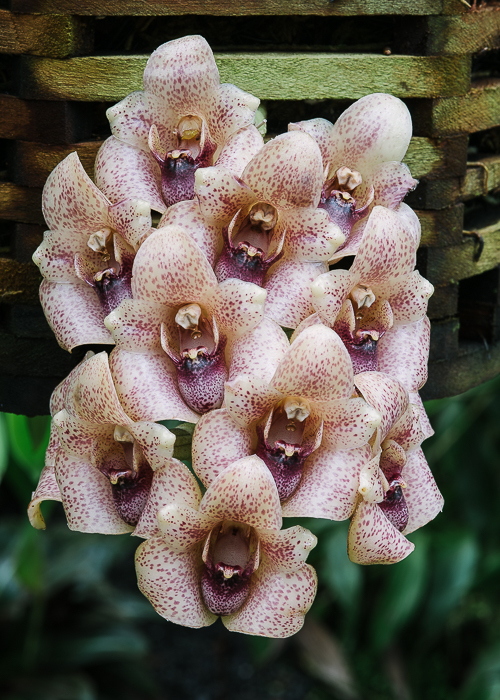 Darwin described the same problem pollinating Gongora in On the Various Contrivances by Which Orchids Are Fertilized by Insects. His solution was to let the pollinia dry for five hours, with the rationale that the pollinia attached to an insect would dry and shrink as the insect foraged. So, taking my cue from Darwin, I removed the pollinarium with its sticky disk from the anther cap using a pencil, and then slapped it onto the surface of the dorsal sepal. No worries about it coming loose. Pollinaria have emerged intact on my clothing after a trip through the washer and dryer at home. The photo above was taken after two days of drying in the greenhouse. You can see that the yellow pollinia have deflated and become concave after dehydrating. Pollination was easy after that. In other Stanhopeinae, like Gongora maculata, the stigmatic cavity doesn't open sufficiently until the day after the pollinia are removed (Dodson AOS Bulletin Vol. 31 No.8). 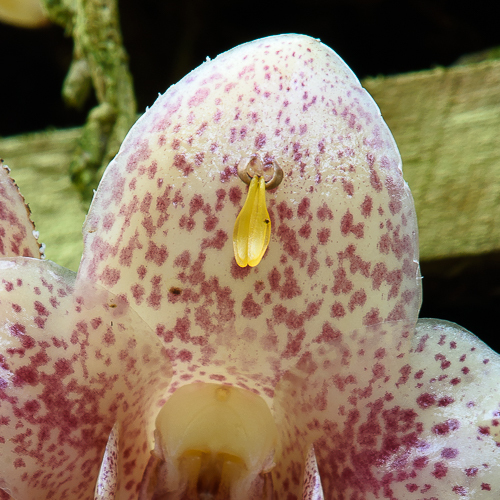 Changes in the size and shape of the pollinia and stigmatic opening make it unlikely that the bee removing the pollinia from an orchid will also pollinate it, and are important mechanisms in preventing self pollination. Though we've had this accession for a while, it has remained Lycomormium sp. in our database since it has floral characteristics of both schmidtii and squalidum. A number of possible explanations exist, but it seems more work needs to be done on this genus. 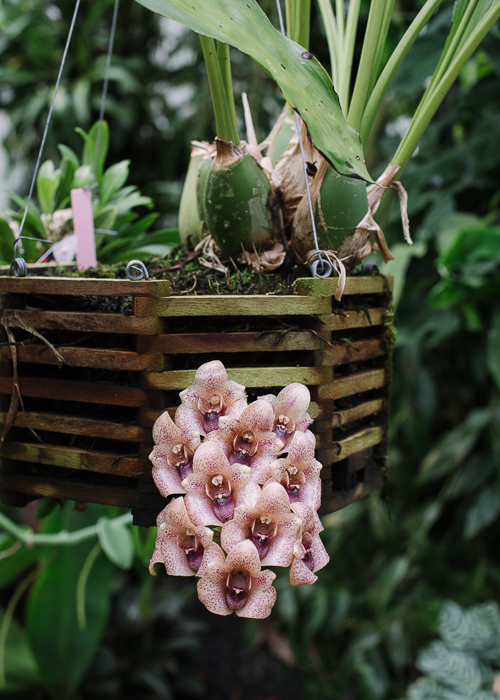 On the subtribal level Lycomormium, Peristeria and Coeliopsis have traditionally been placed in the Stanhopeinae, but more recently Whitten, Williams and Chase (2000) have grouped them together in the Coeliopsidinae based on molecular and morphological evidence.